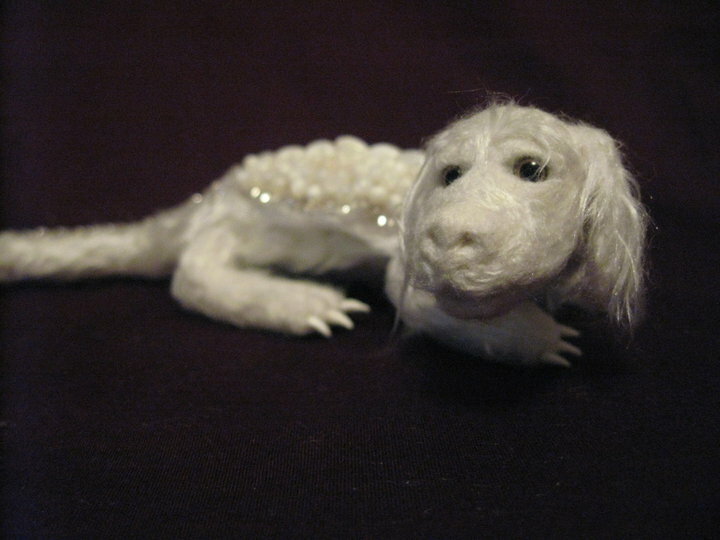 Dollmaker, needle felter, artist, dreamer. I am an American expat loving my adopted country and am inspired in countless ways by the beauty of the landscape, the warmth of the people and the wool of the sheep (and alpacas)! 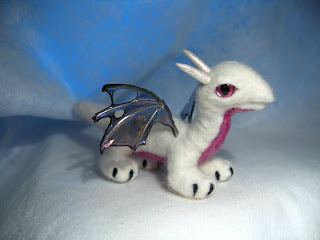 Needle felting...I make mostly fantasy creatures like unicorns and dragons. I also make cloth dolls, paint and sculpt. A lamp, an alarm clock, a box of tissues, Terry Pratchett's "Soul Music"
I mostly draw inspiration from a feeling, an impulse, my surroundings at present. When I was younger and developing creatively I was very much into Tim Burton, Jhonen Vasquez, Tim Bradstreet, Frank Frazetta, Boris Vallejo, Brian Froud & Brom. Most of those artists are very dark and well that is sort of my thing. Christopher Moore, Terry Pratchett, Terry Brooks and Piers Anthony shaped my mindscape. Movies like Labyrinth, The NeverEnding Story, Willow, The Princess Bride and The Dark Crystal were very formative for me when I was younger and I have watched them countless times. When I am creating, I am listening to anything from Lady Gaga to Serj Tankian to Nine Inch Nails depending on my mood. Work, gym three days a week, felt, sleep. If I had my way, I would be home all the time working on my dolls in progress. Alas, the day job pays most of the bills. I really just take whatever free time I have and use that for inspiration and creation. I wouldn't call it a screw-up, but I was making a unicorn head when I noticed a slight resemblance to Falkor the Luck Dragon from The NeverEnding Story. That same unicorn head ended up becoming the centre of my favourite piece. A desk in the corner of the lounge. A workroom of my own with a nice view, more storage for my supplies, hand carders, more wools and fibers. I'd like to learn to spin... I think making interesting yarns would be a very cool thing. Dyes and the patience and time to dye my own wool. I'd also love some animals of my own to "grow my own" wool. My dream is to open my own doll supplies shop where I would sell all sorts of supplies, teach felting classes and sell my work in the shop along with other local artists. you are so clever Irma your creations are just beautiful. Lovely to get to know you a little more! Your creations are so beautiful and detailed.